To prepare perfect bloody mary, you need to have a best tomato mix. The store bought mixes cannot give best taste experience as they have certain preservatives and follow cooking techniques that ruin the subtle minor tastes of ingredients. 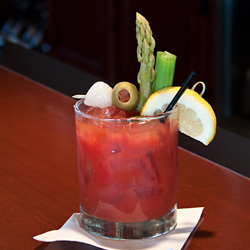 This best bloody mary cocktail recipe requires use of standard as well as few add-on ingredients like horseradish sauce and advanced preparation to allow flavors to combine together. Continue reading the recipe and tips given below to learn how to make it. Blend tomato juice, lemon juice, Worcestershire sauce, Tabasco pepper sauce, prepared horseradish, salt and ground black pepper in a blender jar. Strain and pour prepared mix into bowl and keep it in a refrigerator to chill for two hours. Once completely chilled, add crushed ice in all serving glasses. Pour 1 oz vodka in each of the glasses. 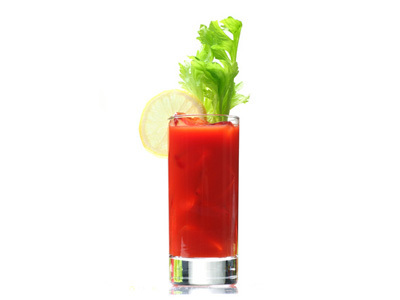 Pour approx 4 oz (120 ml) chilled bloody mary mix in each glass and gently stir. Garnish with celery stalk and cilantro leaves and serve. To get an additional flavor to prepared mix, add 1 teaspoon minced garlic along with other ingredients in blender. You can also use limejuice instead of lemon juice in same measure for different flavor. You can use both lemon juice and lime juice in equal measure for more complex taste. The cocktail prepared with this recipe is little less spicier and less hard compared with original bloody mary cocktail recipe. Increase the quantity of vodka to 45 ml (1½ oz) to make it stronger. Do not use prepared horseradish that is creamed. The longer you allow bloody mary mix to chill and settle, better the flavors. Long setting time will allow all sauce’s flavors to mix with each other deeply. Taste: Mild spicy and flavorful in each sip. Serving Ideas: Serve it as welcome drink for brunch parties.